« Loading… Loading… Where Did Those Spinners Come From? I’ve been looking at why people bother to visit government websites. I’ve mentioned this particular research before, and I’m turning to it again. It was a sweeping study released last spring that looks at Canadians’ internet use and expectactions for the GoC’s web presence. Here’s the bit from the phone survey that shows what users tend to do on GoC websites. OK, so about 1/4 of telephone respondents recalled going to GoC sites to get a form or a publication – this was more common even than looking for government jobs. I would have liked to see a bit more fine grained info here – “obtained a publication” could just as easily refer to downloading a PDF as it could to ordering a print copy. But the mechanics of posting PDFs for download is totally different than what’s involved with maintaining an order fulfillment webapp (not to mention bricks and mortar part – warehousing print pubs and doing the pick-and-pack and all that). 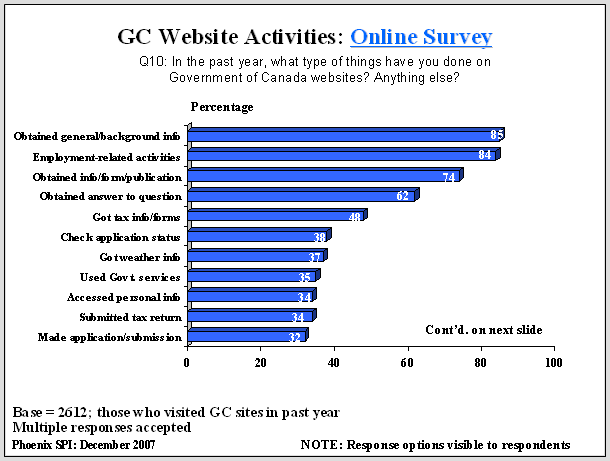 But in the online portion of the survey, even more respondents – like 3/4 of them – went to GoC sites to get forms or publications. I imagine that the online respondents would be more web savvy and interested in using their computers to get government info and transact their business with us, so it’s kinda cute that lots of them were interested in old-school content formats like pubs… or maybe that just points to how outmoded government thinking is when it comes to creating and distributing content. Anyhow, what all this says to me is that government websites must make it easy for visitors to get at publications and forms. I might be biased, but I’d argue for making a “publications” link very prominent in your site’s nav template. And then make your catalogue easy to work with — will blog more about this next week. I visit the Service Canada regularly in order to register a change of address so that the government might communicate more efficiently with me re taxes, etc. The reason I go regularly is because the site is never available. Service Canada has been out of order for six weeks or longer. And of course one doesn’t find this out until after spending some time filling in the intro pages to the site. Do you suppose anyone inside government has noticed? Wow if that is the case then that is really annoying, especially coming from an org with “service” in their name… another puzzling thing is that they don’t accept email inquiries, you have to call 1-800-622-6232 or go visit them in person. great Blog, I just got wind of it through Nick at CPSrenewal.ca. I agree with your idea of having a “publications” link on the GOC sites….to be honest I would push it even further and say we should look at the framework of sites like Dell and how they manage their Downloads/technical docs and manuals. I believe that canadian consumers are Net savvy enough now to expect to have a seperate area to look for when they need to download something or interact with online services…I for one always look for the downloads or documents tab right away and vutto the chase! Make it easy and it will drive usage….make it hard and it will drive complaints to the 1-800 #…which from a cost containment perspective is a lot more expensive 😉 Hey it’s not because it’s government that we sjouldn’t think of it!!!! !